Staffordshire Bull Terrier puppies are adorable just like any other Pit Bull puppy. Staffordshire Bull Terriers are said to be the link between American Pit Bull Terriers (APBT) and American Staffordshire Terriers (AmStaff). SBT’s are smaller dogs with a height ranging from only 14 to 16 inches. Staffordshire Bull Terriers can weigh up to 40 pounds and stands grounded. Although they are small in stature, these dogs are very strong for their size. Staffordshire Bull Terriers‚ if well cared for can have a lifespan up to 15 years. They come in many coat colors ranging from black, blue, fawn, white and even in brindle markings. Staffordshire Bull Terrier puppies are very energetic and playful, they should be taught basic obedience at an early age. They are very people friendly dogs and are extremely easy to train and work with. While they are puppies, these guys love to explore and get into all sorts of trouble around the home. Staffordshire Bull Terrier puppies are naturally curious and their energetic persona makes it even worse. 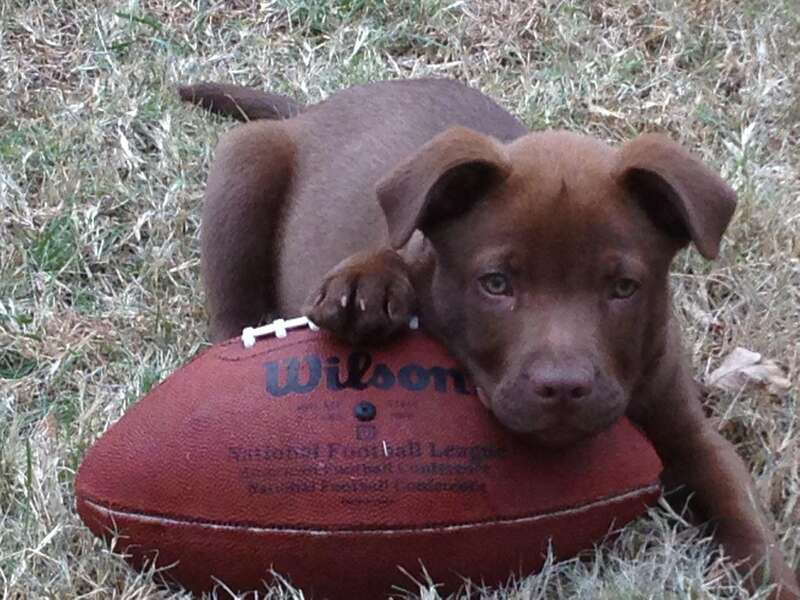 They love to chew on many household things so you should prep your home before you bring the puppy home. Have plenty of toys for them so they do not go hunting for household items such as electric wires. Also good luck in finding them a toy that they can’t easily tear through with those scissor sharp teeth of theirs. The following Kong toy has worked for my Pit Bull’s over the years KONG Extreme KONG Dog Toy, X-Large, Black . Puppies should be taught bite inhibition early in life and they should not be separated from their litter before 8 weeks of age. During their initial stages of growing up, someone must be home to guide them and teach them on what is wrong and what is accepted. During this time, you should also take advantage and set them a schedule for potty training. When they have an accident inside your home, you can use a loud verbal intervention and take them outdoors. Praise them with treats when they go and relieve outdoors, a positive reinforcement always works best with a Staffy. You should never hit your puppy no matter how frustrating it is, some dogs take longer to potty train. They will have a few initial accidents on your carpet or else where but be persistent in getting them potty trained. Always clean up any accidents with a good deodorizer so that the puppy isn’t encouraged to relieve in the same spot again. You shouldn’t have too much trouble potty training a Staffordshire Bull Terrier puppy, they are fairly easy to train. 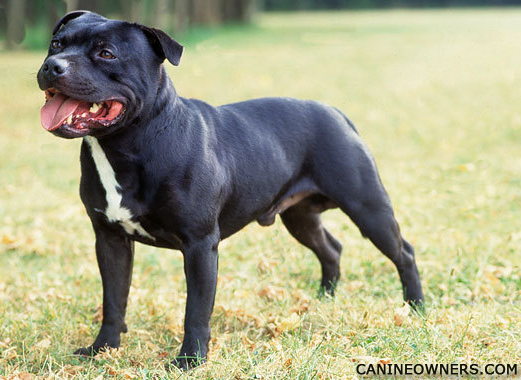 The Staffordshire Bull Terrier is a highly courageous and a brilliant dog however they do not make great guard dogs. They are not bred for guarding purposes however they will do great in agility competitions. When it comes to strangers, the Staffy is selective and can either like or dislike a person. They are very loyal to their own pack and is very tolerable of little kids. Staffordshire Bull Terriers will also get along with your cats and other small animals as long as you give them clear guidelines as a pack leader. They will do fine indoors but these dogs are happier outdoors but they will be fine as long as you exercise them. Staffordshire Bull Terriers have try following health concerns which include Cataracts‚ Hip Dysplasia and Mast Cell Tumors. Hip Dysplasia and Cataracts can be almost eliminated by buying puppies from a reputable breeder who conducts health checks on the parents. Staffordshire Bull Terriers should be put on a good diet that contains a good source of animal protein. You can pick from Orijen‚ Earthborn and Blue Buffalo dog foods. 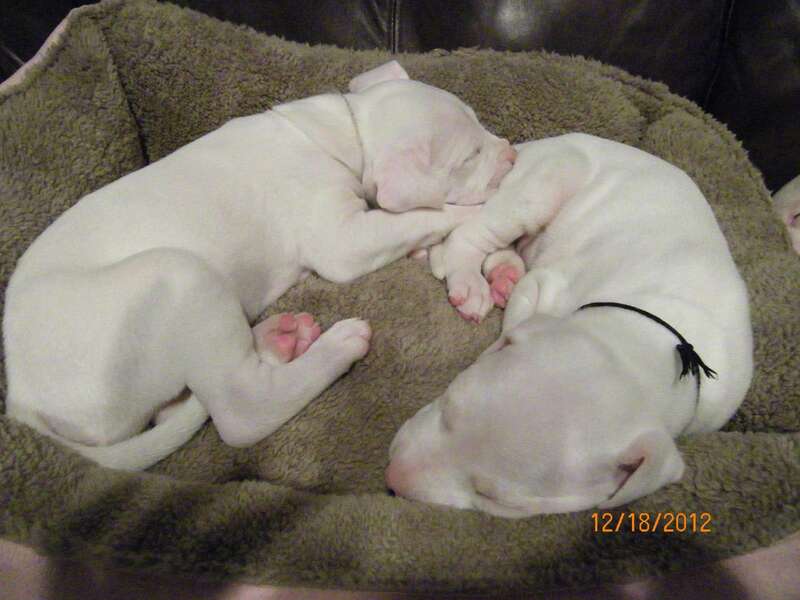 You should stick with a grain free formula for your Staffordshire Bull Terrier puppies. Staffy’s are easy to groom all they need is a weekly brushing to get rid of all the loose hairs. Some Staffy’s come with their dewclaw removed as the standard. Staffy’s nails should be clipped short so that they don’t injure anyone if they jump up. 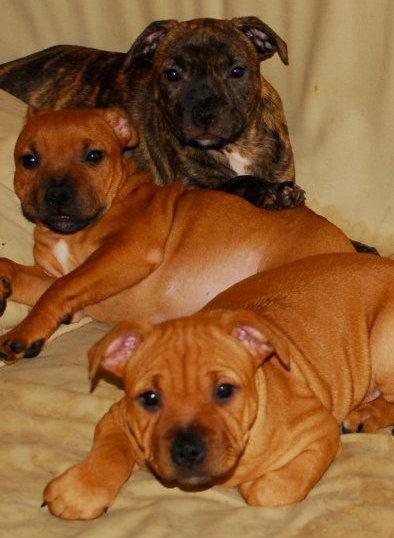 Staffordshire Bull Terrier puppies are a joy to own and raise‚ be sure to leave us comments if you are a Staffy owner. Thanks for reading this article and for your opinion. I have just adopted a staffie pup from aspca and he is adorable everything you said is true we had him house trained in 3 days love playing with the kids. We taught him to bite only his toys and not our hands, he is very clever. I’m so happy we got him.